Adobe is halting development of a Flash-to-iPhone software tool introduced with its Creative Suite 5 last week, dashing the hopes of many that Flash will be supported in future iPhone updates. The move further escalates tensions between Apple and Adobe. Adobe now says it plans to concentrate on developing for Google's Android mobile operating system, according to a blog post by Mike Chambers, Flash platform product manager for Adobe. Adobe's move comes hot on the heels of Apple's new iPhone OS developer agreement, introduced last week, which prohibits developers to use third-party app compilers, such as Adobe's own tool included in Flash CS5. Despite halting development for the Flash-to-iPhone compiler. Chambers said Adobe would still be shipping the tool with Flash CS5. Chambers says he doesn't believe Adobe's time and resources spent on developing the Flash-to-iPhone compiler were a waste. He argues that the tool proves there are no technical reasons stopping Flash running on the iPhone. With various occasions, Apple CEO Steve Jobs has reportedly called Adobe's Flash technology "buggy" and a "CPU hog". 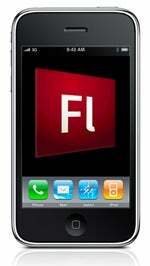 When Apple introduced the new iPhone developer agreement blocking Flash CS5-compiled apps in its App Store, I asked whether it was checkmate for Flash on the iPhone. Right now, it looks like it is indeed. There are even rumors saying Adobe intends to sue Apple because of this, yet no official reports are backing this up. "Fortunately, the iPhone isn't the only game in town," Chambers iterated on his blog. He says Adobe is working closely with Google to bring Flash Player and Adobe Air to Android-based smartphones (Motorola Droid, Nexus One, HTC Incredible, Sprint Evo) and upcoming tablets. So far, we have seen several demo videos of these technologies, and promises of an H2 arrival, yet Flash for Android phones is available only on a very limited number of devices.